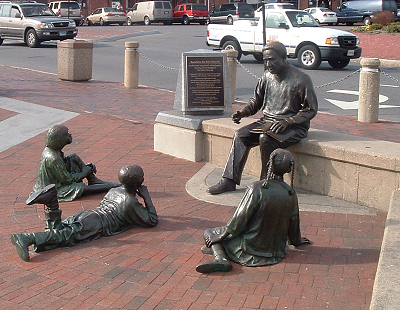 The Kunta Kinte-Alex Haley Memorial, located at the City Dock in historic Annapolis, portrays in word and symbol the triumph of the human spirit in very difficult times and conveys Alex Haley’s vision for national racial reconciliation and healing. It stresses the importance of maintaining strong family connections and of preserving and honoring one’s family history and cultural heritage. It is the only memorial in the country that commemorates the actual name and place of arrival of an enslaved African. The Memorial consists of three distinct areas: the Alex Haley sculpture group, Compass Rose and Story Wall. The Kunta Kinte – Alex Haley Memorial, located in Annapolis, Maryland at the head of the City’s harbor, commemorates the place of arrival of Alex Haley’s African ancestor, Kunta Kinte, to the New World, as told in the book Roots: The Saga of An American Family. This Memorial is the only memorial in the United States that commemorates the actual name and place of arrival of an enslaved African. It portrays in word and symbol Alex Haley’s vision for national racial reconciliation and healing, and symbolizes in Kunta Kinte and his descendants the triumph of the human spirit in very difficult times. The Memorial includes a sculpture group of Alex Haley reading from a book on his lap to three children of different ethnic backgrounds. As he stretches his hand toward the Chesapeake Bay, he tells his family’s story and the story of the Annapolis port, a symbolic Ellis Island for African Americans. Next to the sculptures is the Story Wall, a series of ten markers topped with bronze plaques lining the retaining sea wall on Compromise Street. On each plaque is a quote from Alex Haley’s story of his family’ journey as told in Roots. Each quote is accompanied by text and unique graphics that explain and illuminates its meaning. Together, the ten plaques tell how the specific story of the struggles of one African and the triumphs of his descendants have universal resonance and meaning for us all.